This report allows you to visualize the inbound and outbound connections within your virtual private clouds (VPCs) to and from public IP addresses. You can apply filters to identify the type of traffic you want to view, to see if connections have been accepted or rejected, or to only view blacklisted IPs in your results. Hover your mouse over any point in the chart to see the communication between IP addresses and the ports they are connected to. Review the AWS topic, VPC Flow Logs, for more information. 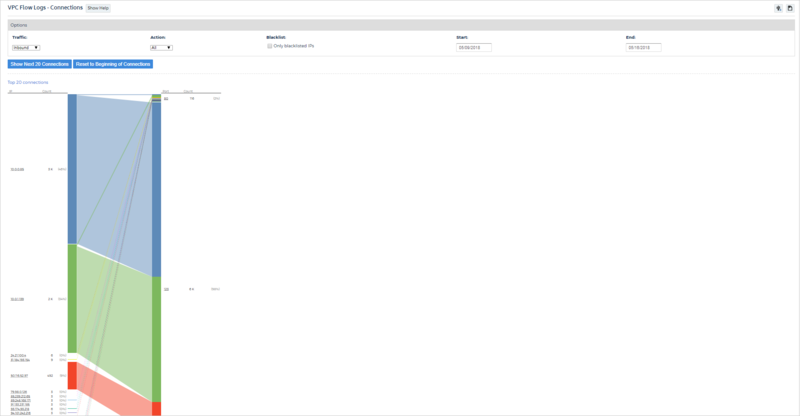 From the left navigation pane, choose Security > Activity Monitoring > Network (VPC Flow Logs) > Connections. The VPC FLow Logs – Connections page opens. In its default state, no connections are shown until you configure your options. From the Traffic drop-down menu, select Inbound or Outbound. From the Action drop-down menu, select All, None, Accept, or Reject. Select the Only blacklisted IPs checkbox if you only want to include blacklisted IPs in your results. 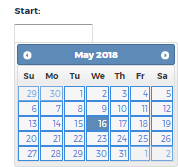 In the Start text field, click to display the calendar and click the arrow buttons to select a date. In the End text field, click to display the calendar and use the arrow buttons to select date. You can also type a Start and End date in MM/DD/YYYY format. Click Show Next 20 Connections. The top 20 connections display on the page.